Rain water, stray dogs, boarding bridge collapse, fall ceiling collapse and others that have not caught attention. These are not teething problems. This is as a result of poor quality and inspection. RAWALPINDI: A four-member inquiry board investigating the collapse of a passenger boarding bridge at the Islamabad International Airport (IIA) on Oct 9 has been looking into various aspects including human error and improper maintenance. Shortly af ter the incident, Civil Aviation Authority (CAA) Director General Hassan Baig constituted the committee to investigate the accident and fix responsibility. Passenger bridges are also known as jet bridges and are enclosed passageways extended from airport terminals to airplanes. The inquiry board is headed by CAA Deputy DG Syed Amir Mehboob and includes IIA Director Expansion Project Sadiqur Rehman, Bacha Khan International Airport Peshawar (BKIA) manager Omaidur Rehman and BKIA Senior Director Kamal Khan. Required to submit its report by Oct 22, the team has started investigating dif ferent aspects after examining the wreckage of the collapsed passenger bridge which has not been removed and has been covered with a plastic sheet. Passenger Bridge No 5 collapsed moments after it was disconnected from a Gulf Airways plane which had started taxiing at the airport on Oct 9, 2018. The inquiry board is to ascertain the damage and cost to the CAA, to evaluate the performance and stability of other passenger bridges and to verify if the operator who was handling Bridge No 5 was properly trained and qualified for the job. According to sources, the inquiry team has been questioning handlers of passenger bridges, including the handler who was operating the collapsed bridge. The sources said the inquiry team will also cross examine those involved in the maintenance of passenger bridges. The team is accompanied by engineers who examined the damaged bridge, its joints and other parts to ascertain the cause of its collapse. Sources said that preliminary inquiries suggest the passenger bridge did not have proper routine maintenance which may have caused its collapse. However, the final report by the four member committee is under process and will be submitted on Oct 22. All the passengers had boarded the plane and the bridge had been removed from the aircraft when the accident happened. However, two people including the bridge operator and a loader were injured. An aviation expert suspected that the apparent cause of the collapse could be the hooks or pins connecting the passenger bridge to another part of the bridge and that the wobbling pins may not have been able to maintain the balance. The inquiry team has also been tasked with verifying the past record of equipment use and the maintenance record. Airline operators committee has sought maintenance record of all passenger boarding bridges installed at Karachi Airport. RAWALPINDI: An international airline that operates from Dubai to Islamabad has not used a passenger boarding bridge since one collapsed at the Islamabad International Airport earlier this month. Other airlines have been using three of the boarding bridges, but with `safety concerns`. Sources said the airline operators committee has expressed concerns about the safety of the bridges and sought information of the bridge collapse, as well as asking the Civil Aviation Authority (CAA) to carry out a safety audit of all the bridges. `Only one airline operating for Islamabad has not been using the passenger boarding bridge since one collapsed. `The other international airlines have used the bridges, but with safety concerns as they have no choice but to use them,` a senior official from an international airline told Dawn. Requesting anonymity, the of ficial said they have asked the CAA for a safety audit of the passenger bridgesand for the facts behind the collapse of the bridge, but have not received a response from the concerned authorities. IIA, which was made operational six months ago, has 15 passenger boarding bridges that cost between Rs320 and Rs380 million each. Three of these bridges are currently operational, and the remainder are being inspected by a team of engineers. A spokesperson for Pakistan International Airlines (PIA) told Dawn that the airline had not been using the passenger bridges at IIA. Passengers instead embark or disembark from planes using stairs. `Three boarding bridges have been declared fit, while the inspection of the remaining 12 bridges is under progress by a three-member CAA team,` a civil aviation official said, adding that the team had not been given a deadline. The inspection team comprises IIA manager airside Maqsood Ali Khan, Mohsin Shamim and CAA engineer Kashif Ali. Sources said that the re-inspection of the 12 bridges was suggested in the report of an inquiry board set up by CAA Director General Hassan Baig to investigate the collapse and determine who was responsible. The board is headed by CAA Deputy Director General Syed Amir Mehboob, assisted by IIA expansion project director Sadiqur Rehman, airport manager at Bacha Khan International Omaidur Rehman Abbasi and Bacha Khan International Airport Senior Director Kamal Khan. It was tasked with submitting a report by Oct 22, which was submitted after a delay on Oct 26. Passenger boarding bridge no. 5, an enclosed elevated passageway that extends from the airport terminal gate to an aircraft, collapsed moments after it was disconnected from a Gulf Air flight that had begun taxiing on Oct 9. The wreckage of the collapsed bridge, which was lying on the apron, or tarmac, had been covered with plastic sheets. The additional director of the CAA`s engineering section, who is responsible for providing engineering views, as well as the inspection of civil works and engineering services for airside and maintenance, said in a preliminary `defect report` that the gap between the bolts and pin connecting the bridge parts was evident from photographs and evidence collected from the scene. Passengers at the airport were surprised to see that stairs were being used to board and disembark passengers rather than the new bridges. `I was expecting a passenger bridge, but I was surprised to see a bus and then a staircase connected to my aircraft at the new airport because it was difficult for me to use the stairs with two children,` said a woman who was travelling to Dubai on Saturday. * Despite reminders, the contractor has not removed technical problems in passenger boarding bridges installed at airports of Faisalabad, Peshawar, Karachi and Islamabad. * Auto-system gearbox not serviced. * HMI screen not showing power tripping. * Tyres need to be replaced. * Metal rollers instead of nylon rollers used in in cable tray. According to news reports, the investigation board formed by Pakistan CAA has not been able to submit its report on the crash of boarding bridge at Islamabad International Airport that happened more than a month ago. The board has not been able to reach a conclusion. Pakistan CAA is seeking services of a foreign company's experts to find out reasons of boarding bridge crash incident. Purposely did not reach to a conclusion in order to protect the ones who were actually responsible or protect the whole corrupt system. How difficult it is to ascertain the cause of this kind of accident. Its not as if they need to investigate 'air crash investigation'. This is not a fair tone. A detailed investigation with a conclusion is very important in view to continues safety. Today, Senate's Standing Committee on Aviation directed CAA to conduct investigation of passenger boarding bridge crash incident that happened at Islamabad International Airport. The committee was informed that CAA is conducting investigation of the incident. Safety of boarding bridge operations at other airports in Pakistan is also being checked/reviewed. ISLAMABAD: A parliamentary committee was told that Emirates airline has refused to use passenger boarding bridges at airports in Pakistan after an air bridge collapsed at the new Islamabad International airport last month. The Chief Executive Officer (CEO) of the Pakistan International Airlines (PIA), Air Marshal Arshad Malik, told the Senate Standing Committee on Aviation that Emirates had announced its decision, citing safety standards as the reason. The committee met for a briefing on how the air bridge collapsed with complete details of its make, model and purchase, among other things. On Oct 9, the air bridge, purchased from the Spanish company Adelte, collapsed, leaving two staff members injured. Director General of the Civil Aviation Authority (CAA) Hassan Baig said the matter was under investigation. “We are looking into several possible reasons such as design faults, human error, maintenance problems as well as communication errors. It can be all four. But, so far it seems to be a design flaw,” said Mr Baig. He explained to the committee that similar faults had been detected with air bridges at Karachi airport and Bacha Khan International Airport in Peshawar. According to the official, a thorough report is due on Dec 7; however, the fault seemed to be in the design of the bridge — apparently, a loose pin. “Similar design problems were detected at both the airports in Karachi and Peshawar,” said Mr Baig, adding that the remaining payments to Adelte had been suspended. According to the contract, the CAA is in a position to ask Adelte to extend the warranty period of the air bridge. The Pakistan Tehreek-i-Insaf’s Senator, Nauman Wazir, however, said that human error must not be ignored. The chairman of the committee, the Pakistan Muslim League-Nawaz’s Senator Mushahidullah Khan urged Air Marshal Malik to take the matter seriously.“Today Emirates has declined to use the air bridges, tomorrow other airlines may follow. The PIA can lose a lot of revenue,” said Mr Khan. The committee also discussed newspaper reports highlighting the involvement of PIA officers in smuggling and money laundering. Air Marshal Malik responded by saying that the matter was indeed sensitive, and would be taken seriously. “Some staff has already been placed under scrutiny and disciplinary action has been taken against two staff members. Their actions bring disgrace not just to the PIA, the Airport Security Force (ASF) and other associated organisations but also to the entire nation,” said the CEO. According to a senior official of the ASF, the various departments must coordinate more efficiently to prevent such cases. “We still lack coordination while checking catering vehicles, for instance,” said the official. ISLAMABAD: The Senate Standing Committee on Aviation called on the Civil Aviation Authority (CAA), on Thursday, to conduct investigation into the recent collapse of bridge/jetty at the New International Islamabad Airport, co-opting with Pakistan Air Force. The direction was given here in a meeting at the Parliament House with PML-N Senator Mushahid Ullah Khan in the chair. 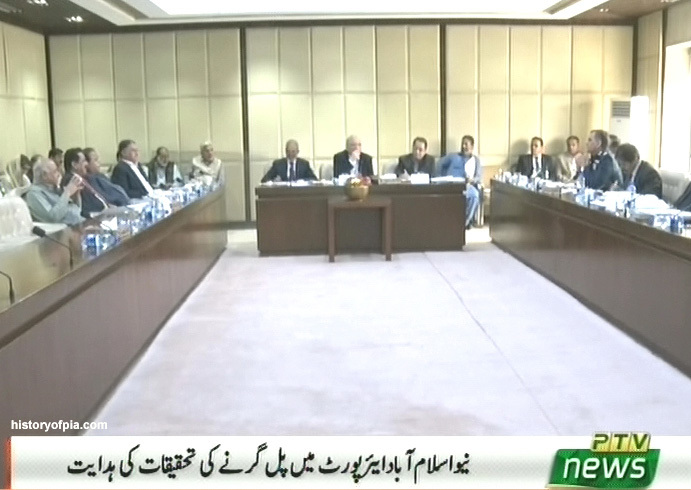 Among others, Senators Nauman Wazir Khattak, Moula Bakhsh Chandio, Mir Hasil Khan Bizenjo, secretary Aviation, PIA chairman, DG CAA, chief meteorologist and other officials from the PIA, CAA also attended the forum. The committee asked the CAA and PIA to undergo this investigation in addition to the board of inquiry which will be completing its inquiry of the incident by December 7. The committee expressed serious concerns over the incident and called for a thorough inquiry as well as a proper mechanism for regular maintenance and checking of all the jetties as it concerns life security of passengers and crew. The forum was informed that the board of inquiry was considering the probability of design faults, human error, maintenance issues and communication which resulted in the incident. Senators called for a check whether there was a warranty protection clause in the agreement with the company from whom the jetties were bought and to check if these were first hand machinery or used. The committee was told that after the incident on October 09 all the jetties at all airports across the countries were inspected. The committee called for an inquiry into the operating staff of the jetties and also about the utility of the training abroad which they were given for the purpose. “All PBBs installed by Adelte were installed in perfect condition in accordance with the agreed specifications contained in the contract agreements signed with the CAA. CAA itself issued taking over and completion certificates after inspection and testing the jet bridges,” the private company said. In a statement, Adelte maintained that after installation of the PBBs, “proper operation and maintenance of the PBBs was and is the responsibility of the CAA and Adelte has no role regarding the same under the Contract Agreements with PCA”. In fact, Adelte pointed towards possible human error when the company said that it had alerted the Civil Aviation Authority on several occasions before the Oct 9 incident towards the safety and structural hazards that could arise from improper operation by untrained and unskilled operators and inadequate preventive measures. Adelte is one of the few companies manufacturing PBBs, and their products are found at a number of international airports. Don't think CAA can escape with their inefficiencies, lack of expertise and unprofessionalism by blaming design of a reputed international company. When contacted, Board of Investigation president Amir Mehboob told DAWN that he could not comment on the issue until the inquiry is completed and the report prepared. Mr Mehboob, who is also the Acting Deputy Director General of CAA, said that it would not be appropriate to fix responsibility until the inquiry is completed which will conclude shortly.